Degroff had limited formal training, and drawing caricatures is a passion she developed after years of doodling in bars and eventually acquired the knack for nailing people. She explains, “I lived in many edgy neighborhoods with bizarre characters. My lower east side tenement featured a different phantasmagoric hell on every floor – from the outpatients from Willowbrook to refugees, gypsies, drug dealers – so there was tons of fodder and I loved to befriend them so I could enter their world and draw them.” Citing Diane Arbus as her biggest influence, Degroff added that her most instructive training came from Friday nights in South Bronx with her best friend (gay and Puerto Rican) and his family eating pastelis, cuchi fritos and learning to dance Salsa, making her the artist she is. 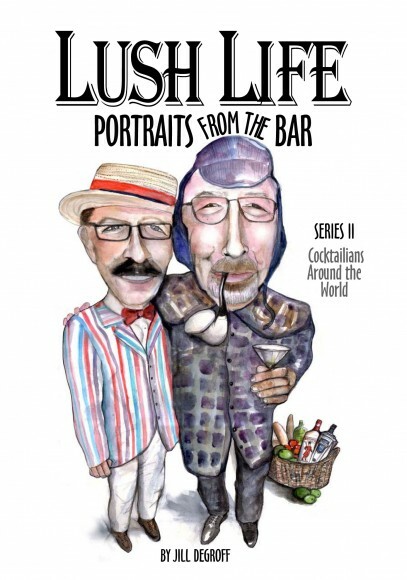 As there is an artistry to the skill of these bar greats depicted on these pages, the same bartenders who are eager to listen to their guests’ story, Degroff’s Lush Life is a chance to see what these bartenders may tell if seated at your bar. Stories tell of hard work and perseverance, while others delight in carefree spirit. No matter the country of origin, each story is as unique as the person telling it, as different as the cocktails they make. A who’s who directory, this quick and enticing read will have you waiting for book three.